Although, we had earlier accepted the invitation with much enthusiasm, last night my husband and I (rudely) no-showed to a New Year's Eve party. Instead of a party with friends we had a nice quiet evening together. 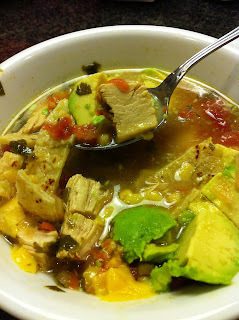 We went to yoga and dined on my husband's (everything-but-the-kitchen-sink) tortilla soup. My still jet-lagged husband had a difficult time staying awake past nine o'clock. That was okay with me. I was happy he was back home in our bed where he belongs. I watched the ball drop live in New York City at 11:00 PM, and then I went to bed too. It was a lovely night. Happy 2013 to you and the ones you love!